You can take the advertiser out of Manhattan... Or, it all comes down to Coca Cola. Through a long and winding road, we finally learned where Don Draper is headed on Mad Men Season 7 Episode 14. 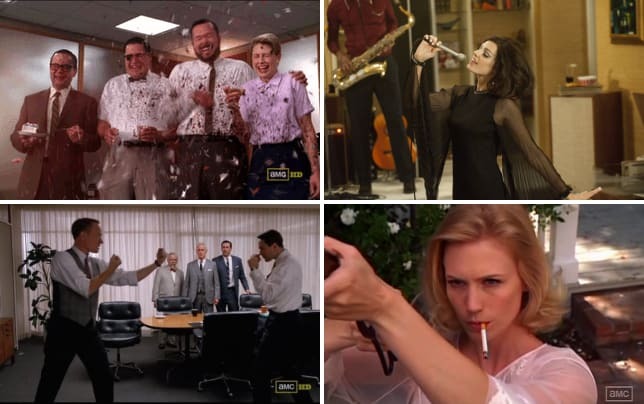 Thankfully, we also discovered the happy endings for many other characters we've grown to love over seven seasons, and that became important as we ambled toward the AHA moment at the end of "Person to Person." Why? Because the interactions between the characters we love made the finale, and there weren't enough of them. Overall, it still worked, true to character. Leave it up to AMC and Mad Men to release a photo of Pete Campbell holding his going away cactus to be representative of the series finale. He pretty much had his happy ending in Mad Men Season 7 Episode 13, but we did get to see him, Trudy and Tammy board the Lear Jet for Kansas as their swan song. Roger had the distinction of firing Don's secretary, Meredith, and informing Joan he was preparing his will and leaving half of his estate to Kevin, despite her protests to the contrary. She's kind of over all of that by that point, and it went well. Roger and Marie appeared to be on the way to happiness ever after. Joan got a good chuckle out of it. As for Joan, she lost Richard for the love of her work. She wanted to form a partnership with Peggy after Ken put the bug in her ear. Richard just wanted to live the dream. After everything Joan had sacrificed to make her mark, when she realized she still had a chance, she jumped at it. Peggy turned down her offer of partnership and Joan realized she could do it on her own, utilizing both her maiden and married names. Holloway Harris was born. It was a good thought, offering a partnership to Peggy, and she wasn't kidding when she said it was only for her. However, there was always an undercurrent of animosity and competition running between the two women and working so closely together would have been a stretch. Stan said it well when he told Peggy, "You have such a rare talent, stop looking over your shoulder at what other people have." Thus began an intricate dance between Peggy and Stan as the hour progressed until he finally admitted what we all knew and had been waiting to hear. If there was to be one extraordinarily happy ending, having it fall into Peggy's lap feels perfect. At the end of the series, she has it all. A great job and a man who has been there for her through throughout. Seeing them working together, with Stan kissing her forehead as she typed copy was lovely. We got, of course, our Peggy and Don moment, as well, even if it was only by telephone. All of Don's final moments came via telephone, and while it wasn't what I would have wished, it was exactly what I should have come to expect from Don Draper. By the time he got around to Peggy, he was lost and frightened, hardly what we'd expect from Don. He realized he never said goodbye to Peggy and the call scared her. I'm sure more than one of us was a little worried Don might not make it out of the finale alive. After all, at the beginning of the hour, Don was testing race cars in the Great Salt Lake Desert in Utah. He was the man who knew all about cars but didn't have one himself until he learned from Sally that Betty was dying of lung cancer. Don and Betty didn't share a lot of loving scenes on Mad Men. While they were married, they were mostly at odds. After they were divorced, they caught up for a night at camp and shared something real, and the conversation they had on the phone about her dying was about as natural and loving as we've seen them. Regressing into loving names like honey and Birdie showed just how meaningful that short call really was and helped to understand what propelled Don into such an odd place with Stephanie. If you had told me our final scenes with Don would be spent at a hippie commune with a bunch of people we didn't know, I probably would have laughed (and still thought there was some truth to it). But where else was Don going to get the idea for the greatest Coca Cola advertisement of the decade? I was a child of the 70s and that song was everywhere. We sang it as if it was a real song. To pretend it was Don Draper in the throes of his life crisis recommitting to his passion in such a profound way? Hell, I can buy that. I did buy that, and I still buy and drink it to this day. If Don Draper spent his entire career wishing to land Coke, in his darkest days, what else would he be thinking about but advertising? Don lived and breathed his career. He put his family on the line for his career. He put everything on the line for his career. It made perfect sense. What did you think about the finale? Was it what you expected? Did the ending rush up and hit you or did the hippie theme have you all along? Feel free to drop your thoughts in the comments! 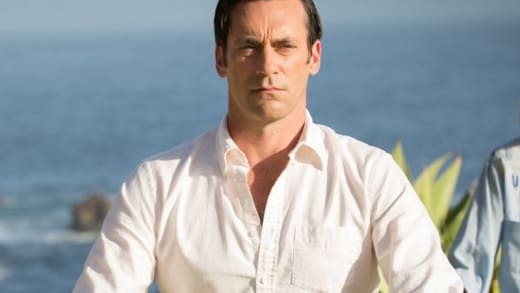 Don't forget, you can watch Mad Men online any time via TV Fanatic. 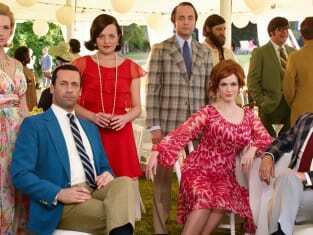 What did you think of the Mad Men Series Finale? A - I'd like to buy the world a Coke! B - Rum and Coke! Coke with spirit. C - Diet Coke. A little light on content for me. D - I still like Coke, but I'm going with generic. Sorry! F - They lost me. Pepsi it is.